The Derwent Inktense Paint Pan Travel Set contains the unique Inktense formulation found in our pencil and block ranges. Unlike traditional watercolour, washes of vivid paint can be applied without dissolving previously dried layers. 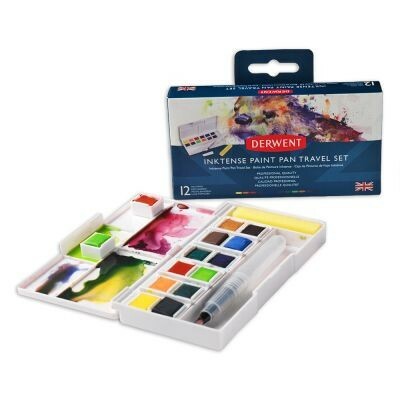 Ideal for travel with everything needed to paint on the go, this set contains 12 highly lightfast Inktense paint pans, a mini waterbrush, a sponge and five mixing palettes. Inktense is suitable for use on paper and fabric for a wide range of fine art and craft projects.